We extend our deepest "mahalo" to the generous donors who have demonstrated their support for the Mālama Learning Center. Hawaiian Electric has awarded Mālama Learning Center with a very generous donation of $50,000 to help us launch our new initiative, Ola Nā Kini. Here we are with Scott Seu, Senior Vice President of Public Affairs at the Grow Hawaiian Festival celebrating Earth Day and HECO's Acts of Aloha in April 2017. We are very happy to give the title of Papa 'Oi 'Oi - the emergent and lead sponsor - of Ola Nā Kini to Hawaiian Electric. Mahalo Nui Loa! 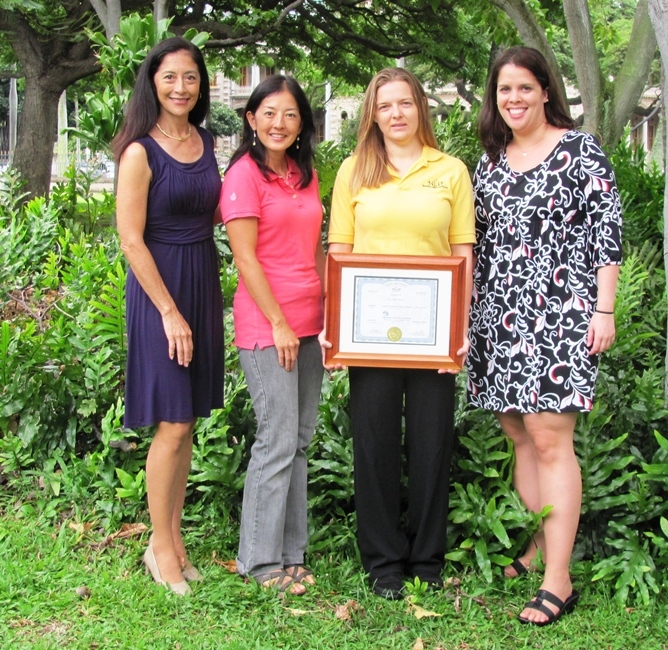 Mahalo nui loa to Hunt Companies for a donation of $5,000. These funds will help sustain Mālama Learning Center's programs with Kapolei High School students, particularly in the nursery and in mentoring the GoGreen Club. The check was presented by Jose Bustamante, Vice President of Hunt Companies, in the presence of GoGreen Club members in September 2014. Thanks to this donation, a lot of exciting activities are planned in the nursery and with the club this year! Through Hawaiian Electric Company’s partnership and support of Hawaiian Legacy Hardwood’s reforestation initiative project that will restore a majestic koa forest to its former glory, Mālama Learning Center is the beneficiary of a $3,000 donation that will fund education programs at Mākeke Kapolei, the farmers’ and green market at Kapolei High School. We plan is to provide educational and information activities targeting West O'ahu families that promote healthy living as well as Hawaiian cultural practices. We are truly appreciative of this generous donation from Hawaiian Legacy Hardwoods designated by Hawaiian Electric particularly because this funding is connected to the planting of native koa trees that will grow and improve our environment for decades to come. Therefore this gift is especially meaningful. Mahalo to Hawaiian Electric for selecting our organization for this wonderful gift. The goal of the Hawaiian Legacy Reforestation Initiative is to create a sustainable koa forest on the slopes of Mauna Kea that will add to the biodiversity of the islands, provide native habitat and sequester carbon from the global atmosphere year-round. Recently, one of our students, Glenn Hiro, who we have gotten to know quite well through the Hawaiʻi Green Collar Institute, Mākeke Kapolei, and the Go Green Club, just completed his Senior Project at Kapolei High, inspired by what he learned from us. He decided to work on reducing plastic bag waste by converting old t-shirts into stylish shopping bags and developing a marketing plan to sell them. With some help from family members and friends, he created several designs of bags and sold them at Mākeke Kapolei, then donated all funds raised to the Mālama Learning Center. What a great and thoughtful guy! We are thankful to Glenn, his family, and teachers and hope that his example inspires others to do their part to help their community. The Mālama Learning Center has received strong support from foundations, businesses, government agencies, community groups, and individuals that have given generously since we began in 2004. Without their support, we would not have been able to come this far.